Prime Minister Narendra Modi on Sunday called for concessional financing and less-risky funds for solar projects to raise the share of solar power in the energy basket, provide cheaper electricity and cut carbon emissions. Speaking at the founding conference of the International Solar Alliance, he said India will generate 175 gigawatts (GW) of electricity from renewable energy sources by 2022. This would be more than double the present renewable energy capacity and would be enough to overtake renewable expansion in the European Union for the first time. Modi, the chief architect of ISA that seeks to bring together 121 nations, presented 10 action points including making affordable solar technology available to all nations, raising the share of electricity generated from photovoltaic cells in the energy mix and framing regulations and standards to support the initiative. He said better and cheaper solar technology should be easily available to all nations. "We have to increase the share of solar in energy mix," he said. Also, innovation has to be encouraged so as to provide solutions to different needs. "We have to provide concessional financing and less-risky funds for solar projects," he said. The ISA's major objectives include global deployment of over 1,000 GW of solar generation capacity and mobilisation of investment of over $1 trillion (Rs 66 lakh crore) into solar energy by 2030. Regulatory aspects as well as standards have to be framed which will expedite adoption of solar solutions, Modi said, adding that consultancy support has to be development for putting up bankable solar projects in developing countries. Stressing on inclusiveness, he said a vast network of centres of excellence has to be created. Solar energy policy has to be to looked at in totality for development so that it can contribute to achievement of sustainable development goals (SDGs), he said. "We have to strengthen ISA Secretariat and make it more professional." Modi called for rising above narrow private goals to make collective effort for the betterment of the mankind. He said India has launched the 'world's biggest renewable energy programme with a target to generate 175 GW of electricity from renewable sources'. Of these, 100 GW is to come from solar and 60 GW from wind. "Of the target for solar energy generation, we have already achieved 20 GW installed solar power," he said. India needs some $83 billion (Rs 5.47 lakh crore) between FY2018 and FY2022 to meet its 175 GW target, according to industry estimates. Electricity from renewable sources is cheap, reliable and clean. Besides providing an alternative to polluting coal-based electricity generation, photovoltaic (PV) has big potential to power irrigation and reduce the use of back-up diesel generators. At present, the country's renewable energy installed capacity is 63 GW. Solar and wind power tariffs have dropped to an all-time low of Rs 2.44 per unit and Rs 3.46 per unit, among the lowest in the world. China is targeting over 360 GW of renewable capacity generation during the period. 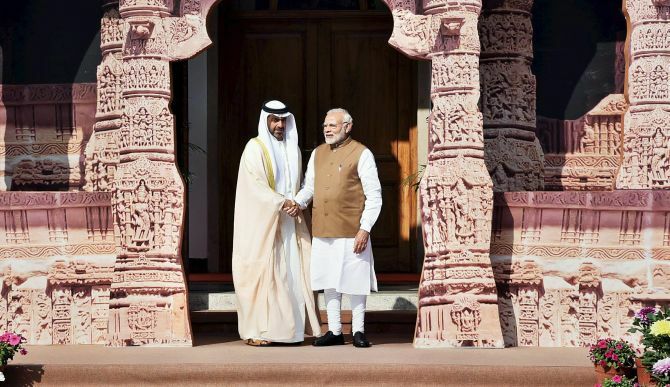 As a demonstration of India's commitment to ISA, Modi said 500 training slots will be created for member countries and a solar technology mission will be started to lead R&D in the sector. To supplement solar energy generation, India has distributed 28 crore LED bulbs in the last three years which have helped save USD 2 billion and 4 GW of electricity, the prime minister said. 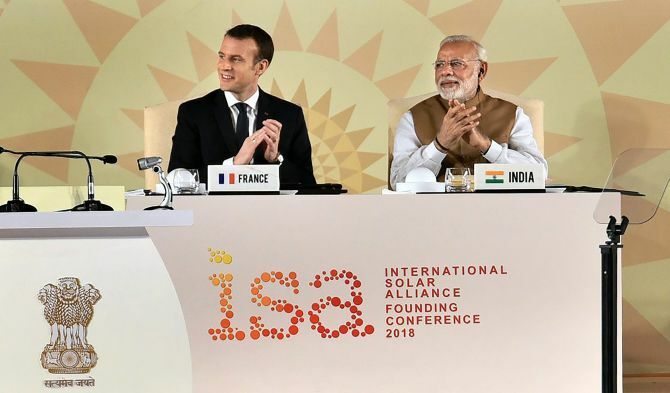 ISA, headquartered in Gurgaon near here, is now a treaty-based inter-governmental organisation that was established following the Paris Declaration as an alliance dedicated to the promotion of solar energy among its member countries. The prime minister said of the 121 countries associated with ISA, 61 have joined the alliance and 32 have ratified the Framework Agreement. Indian 'Vedas' have since thousands of years considered sun as at soul of the universe and a nourisher of life, the PM said. "We have to look at this ancient balanced and all-encompassing philosophy when when we today look for ways to deal with the challenge of climate change," he said. Modi had in a speech at London's Wembley Stadium in 2015 proposed the idea of an inter-governmental organisation comprising of 121 countries, which lie either completely or partly between the two tropics, with an aim to promote solar energy. ISA was launched by him at the India Africa Summit in New Delhi and the United Nations Climate Change Conference in Paris in October 2015 and November 2015, respectively. On Sunday, heads of 23 nations and 10 ministerial representatives gathered in New Delhi for alliance's first summit. The summit was co-hosted by French President Emmanuel Macron. Speaking on the occasion, Macron said $1 trillion will be needed to achieve one terawatt (TW) of solar power capacity by 2030. "The development of solar energy will not just lead to our prosperity, but will also reduce the carbon footprint of the earth," Modi said on Sunday. Stating that better and affordable solar technology is available to all must be ensured, he said, results would be even better if other forms of energy are linked to solar. Solar energy can have a variety of uses - agriculture, solar water pumps, clean cooking. "We need to encourage innovation in the solar energy sector to find different uses for it," he said.